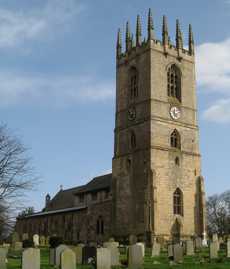 Despite its name, this stone church does not have a steeple although it does have a massive tower. The earliest portion is found in the north wall of the chancel, c1180, though probably rebuilt in 1870. The rest of the nave and chancel were largely re-built in 1901-2 following a fire, but using earlier architectural details. The south arcade was re-built in the 13th century, the lower part of the tower and the chancel windows, stalls and screen in the 14th century. The upper stage of the tower, with twelve pinnacles, was added in the 15th century. In the Transitional period the church was enlarged to the west and the arcade consists of three arches on cylindrical columns. Without a tower for a century, then it was built straight in by removing one bay off the arcade. The present five-light east window appears in old photos as originally on the south side of the chancel. There is a chancel, a nave, aisles, an organ chamber, vestries, a porch and a large west tower with a clock and six bells (the back five by T Mears). In 1870 the clerestory was removed during a restoration programme overseen by Ewan Christian. The interior was subsequently destroyed in a fire on 24 February 1901. The greatest loss was the 15th century rood screen. 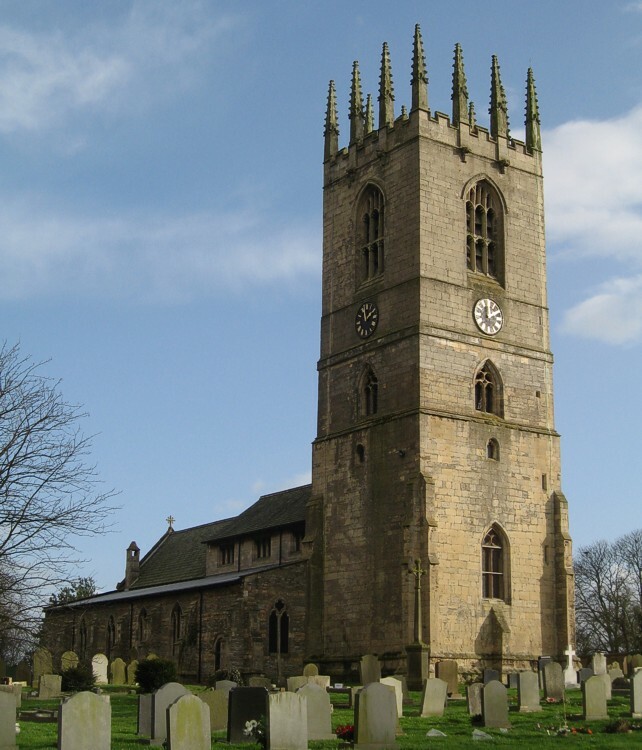 The church was restored by Hodgson Fowler, who reinstated the clerestory. The pre-1901 stained glass has been reproduced: the west window dedicated to Richard Battye (d1873) by Clayton & Bell, now by Heaton, Butler & Bayne, who also did one of the Foljambe windows. The chancel window was reproduced by Messrs Drake, the north-west window by Messrs Newberry and the east window by Kempe & Co.
Stone monuments in the church are for Lady Oliva de Montbegon (d c1236) and Dame Frances Earle (d 1687), a life-size standing figure, and Colonel Francis Thornhaugh (killed in 1648).